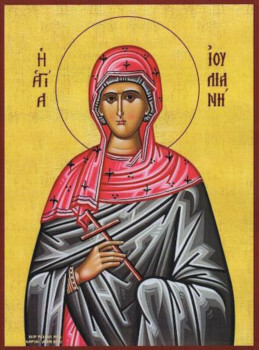 Science of the Saints, 3-I-2019 (21 Dec.) The Holy Martyress Juliania of Nicomedia. The Holy Martyress Juliania, daughter of an illustrious pagan named Africanus, was born in the city of Nicomedia. In her adolescent years she was betrothed to a certain Eleusios. Saint Juliania was endowed with a profound intellect and an inclination to goodness of soul, and she saw through the delusion and deception of the pagan faith. She secretly accepted holy Baptism. When the time of the wedding approached, Juliania resolutely refused to be married. Her father began to urge her not to break the long engagement but, not getting his wish, he began to beat her viciously. Then Africanus handed his daughter over to the magistrate of the city – who was that very Eleusios, the former fiancé of Juliania. Eleusios heatedly asked Juliania to marry him, promising not to require of her a change of faith. Saint Juliania refused and preferred the torture. They beat the saint both long and harshly, but after each beating she received from God healing and new strength. Her beating was done before a large number of people. Of these, 500 men and 150 women came to confess Christ, having witnessed the steadfastness and courage of the holy virgin miraculously healed from her wounds. They were beheaded, having been baptised in their own blood. Convinced finally of his own hopeless attempt to tear the holy virgin away from her Heavenly Bridegroom, Eleusios sentenced Juliania to death. She accepted the sentence with joy and glorified the Lord for permitting her to receive a martyr’s crown. The execution of the holy Martyress Juliania was done in the year 304. Previous Previous post: Science of the Saints, 2-I-2019 (20 Dec.) The Holy Martyr Ignatius the God-bearer. Next Next post: Science of the Saints, 4-I-2019 (22 Dec.) The Holy Great Martyr Anastasia.